Time for a life change? Dedication and perseverance are important characteristics. Plenty has been written about the need to persevere when times get hard. It is equally important to know when there are things in your life that are holding you back and when it is time to stop doing things that are impeding your progress. Here are some warning signs that things in your life need changing. If you spend all your time looking back at the past you need some change. Your past may have made you who you are but it does not need to define your future. If you spend more time looking back at the things in your past than looking forward to the future you are headed in the wrong direction. Periodically you need to take another look at the past. What mistakes have you made and what can you learn from those mistakes. Keep these looks back as brief as possible. Develop a plan to move forward and get started. The sooner the better. If you think that your happiness lies only in the future. Do not wait for something or someone to begin being happy. Happiness occurs in the present. If you are not happy in the journey you will arrive at the future with nothing but regrets. Any unhappy now creates an unhappy future even if you reach the destination you are working towards. Enjoy the trip for its own Sake and the result will take care of its self. If you are full of anger you need to change. Anger is a poison that destroys you from the inside out. Change what you can. Accept what you can’t and clear out those angry feelings as soon as possible. The heat of anger can burn you. If you are full of anger, you need to change you. Demanding that someone or something else change will keep your stuck. Blame others and you avoid the only real solution, changing you. You can’t remember being happy – life is no fun it is time to change. If nothing makes you happy, if life is just no fun anymore, you need to change something. This may be a disease called Major Depressive Disorder. That disease needs professional treatment. But if the case of your life of “no fun” is you, learn to lighten up. Let yourself have fun. Life was not designed to be all pain and drudgery. You have to go through some things but do not volunteer to be the victim. Work on creating the best possible situation in the place you find yourself. Look for ways to make your life more fun. The little moments of joy add up to a happy life. When you have to hide your real self from others you need change. If you are hiding who you are, particularly if you do this because you need others to like you, this is a bad sign. If you are not who you want to be, work on changing that. If the problem is that others will never approve of you, then it is time to change friends, change jobs or change any other situations that are keeping you from being your fully authentic self. When you feel you need to change others it is you that needs to change. Trying to change others is a difficult proposition. You can create the right conditions to encourage others to grow but if you start to feel that your prime objective is to change others, take another look at yourself. Learn to accept others as they are or get as many of these people out of your life as you can and do it sooner not later. Consistently feeling you need to change others in your life should tell you that you are living a conflicted life. Accept others or change your situation. You protect others from themselves and the consequences of their actions. If you are trying to protect others from themselves you are living someone else’s life. You need to stop doing that. Let others bear the consequences of their actions. Being over-involved in others lives is called codependency and this is a second-hand life. Let others solve their problems and you solve yours. When nothing interests you anymore change is indicated. Loss of pleasure, not being able to enjoy things you used to enjoy is a symptom of the depressive disorders. If nothing is fun anymore you need to change that. Look at the things you used to like to do. Have you stopped enjoying them? Why? Is it you being the kind of person you would like or is it the people you are around? Look for new interests, try to put the fun back in your life. Be open to new activities and new hobbies. Go place you have not been. Take a new route to work. Eat something new. Meet new friends. If life is boring you need to make some changes. When you live in constant emotional pain please change. Pain circuits, especially the emotional ones, were not designed for constant pain. if you are never out of pain look for new positive solutions. Find new ways of looking at things. Let go of anything causing you pain. Learn to be mindful and enjoy the positive things in your life. A good, mental attitude and learning to live mindfully and in the moment can reduce both physical and emotional pain. You are settling for less of a life than you could have. If you are settling for less of a life than you could have – why? Look for ways to improve your situation. Design a new happy life and move towards that joy-filled life. Life can get better if you just get willing to move out of the place where you are stuck and start living again. 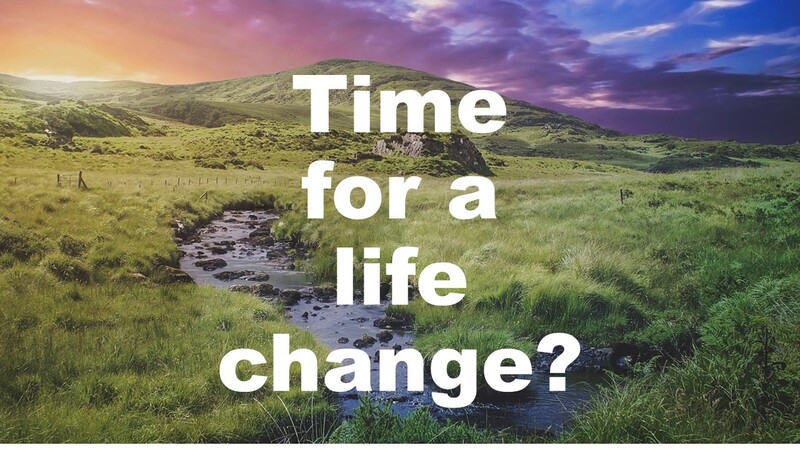 Is now a time for you to change? This entry was posted in Recovery and Resiliency and tagged change your life, constant emotional pain, full of anger, happiness lies in the future, life is no fun, looking at the past, need to change others, Times you need to change, you hide your real self by David Joel Miller. Bookmark the permalink.